There are several major dental patient communication software systems on the market, such as Lighthouse 360, Demandforce, Solutionreach (formerly known as Smile Reminder), RevenueWell, Weave and PracticeMojo, which help practices streamline their communications with patients. Some systems, such as OperaDDS, also include intra-office communications capabilities, which also offers several benefits, especially for larger practices with several doctors and staff. However, for the purpose of this article, we'll focus our attention on patient communication software systems specifically, which typically focus on patient recall, appointment reminders, and online reputation management. How Much Does Dental Patient Communication Software Cost? The price varies among vendors, but you can expect to pay about $300-$400 per month for most reputable systems. Many systems also have one-time setup fees, which can cost another $300-$400. However, these setup fees are typically negotiable, and are often waived. The monthly fee is often negotiable as well, especially for companies that require long-term contracts -- the longer the contract you agree to, the lower the monthly fee. Though some systems, such as Solutionreach and Demandforce, require long-term contracts, others, such as Lighthouse 360 and PracticeMojo, are month-to-month without any long-term contracts. For larger practices with a substantial patient volume, patient communication software is a no-brainer investment -- to break even, you would only need to prevent a few no-show hygiene appointments per month (factoring in overhead), or just one high-production appointment. If you do better than that, then it's a profitable investment. In addition, you can expect to save your front desk staff a substantial amount of time, since the software will take care a lot of the patient communications that they would otherwise have to do manually. You may also save money on postage by shifting your patient communications from postcards and letters to emails and text messages. For smaller practices with lower volume, it may still be worth investing in a dental patient communication system. However, it could also make sense to handle patient communications manually, and to use a generic system like MailChimp (which is free for up to 2,000 patients) to send newsletters to patients. How does Dental Patient Communication Software Work? Most systems work by syncing with your practice management software in order to extract patient appointment information, as well as contact information. Once the communication system has this information, it can then do its job of communicating important information with the patient. Though it may sound like a subtle point, it's important that your patient communication system and your practice management software stay up to date with each other. This ensures that both systems have the most up-to-date information possible, which can help avoid the awkward situation in which a patient cancels an appointment, but then continues to receive text messages reminding them about that appointment. Generally, the more frequently the system syncs with your PMS, the better. Since most patient communication systems rely on data from your practice management software, you'll need to make sure that the system you select integrates with your practice management software. The primary value of patient communication systems is in their ability to help with patient retention. To help reduce no-shows and cancellations, most systems let you send text messages, emails, or automated phone calls to remind patients about upcoming appointments, and to confirm appointments. Lighthouse 360, one of the top dental patient communication systems, reports that its users are able to reduce no-shows by an average of 40%. Many systems also have the capability to "cluster" family appointments, so that there is only one message sent to the entire family, as opposed to one message for each family member. This helps families avoid being bombarded by appointment reminders, and also adds a level of professionalism to your messaging. The systems can also help reactivate patients by identifying those who are due for appointments, and sending them emails, letters, or postcards in order to remind them that they need to schedule an appointment. Some systems, such as Lighthouse 360 and RevenueWell, are able to read treatment plans from your practice management system, and identify patients who have unscheduled treatment plan procedures. By messaging these patients, you can help prevent them from falling through the cracks, and ensure that they receive the care that they need. Newsletters are an important aspect of maintaining a strong relationship with your patients. They help keep your practice at the top of the patient's mind, so that when they need to see a dentist, you'll be the first option that they consider. In addition, newsletters can be an excellent way to help improve patient education, which can ultimately lead to an increase in case acceptance. Many dental patient communication systems help you engage with existing patients by sending them newsletters. 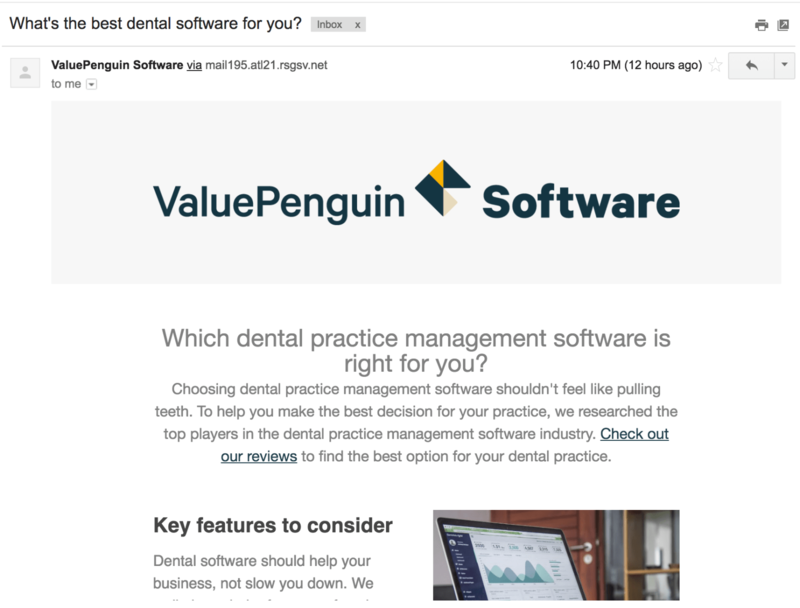 You can typically customize these newsletters with your own content, and also create marketing campaigns that offer certain deals, in order to get patients back in your office. Most systems will also offer reporting capabilities that will help you analyze the performance of these various campaigns, so that you can understand which marketing campaigns are performing best. Though this practice has positive reviews on multiple sites, including 1800+ positive reviews on RateABiz, they could benefit by gathering some more reviews on other sites, since they only have 3 reviews on Google, and a few reviews on Yelp. 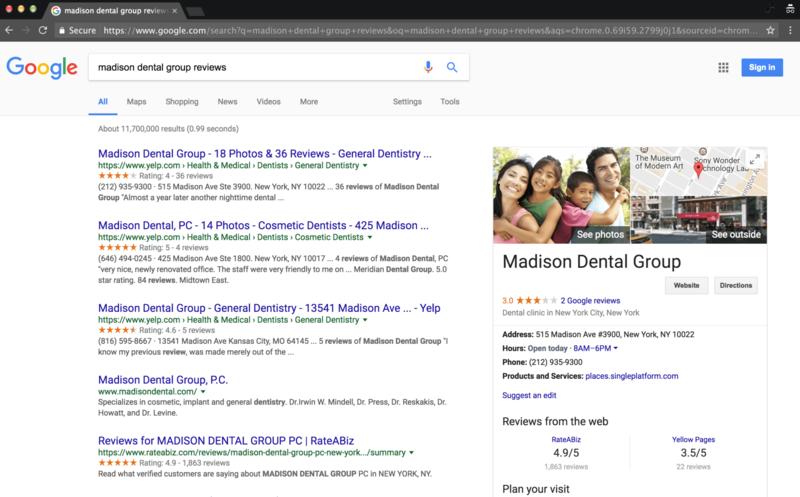 Though any site that has a positive review for your practice is beneficial, it's just one piece of the puzzle, and typically users will value Google/Facebook/Yelp reviews more than they will these other, lesser-known sites. For this reason, even if you use one of these systems to gather reviews, we still suggest that you make an additional effort to solicit reviews on Google/Yelp/Facebook (though this typically requires a bit of legwork). Although these solicited patient reviews may be less valuable for attracting potential patients, they can still help you indirectly attract more business by providing you with valuable patient feedback that you wouldn't have gotten otherwise. You can use this feedback to improve your practice, and to improve your patient's experience -- if you see a trend where many patients mention that something can be improved, then that's powerful information that you can use to your advantage. Dental Patient Communication Software: Is it worth the price? Most reputable systems will end up costing you about $300-$400 per month. There are some benefits which are quantifiable, such as the increased production that results from reducing no-shows. However, these systems do carry a substantial number of other intangible benefits, such as increases in patient engagement, patient education, and staff efficiency, and an improved web presence from patient reviews. If your patient volume isn't high enough, then it may not make sense to make this investment. However, if your volume is sufficiently high, then in most cases you can directly recoup the monthly cost by reducing the number of no-shows -- plus, these systems offer many other intangible benefits that can help you improve and grow your practice over time.